This is the party version (unfinished preview) of this demo for pure ZX-Spectrum 128 with MB-02+ disk interface. Few words from me: I've started to work on this demo just 7 weeks ago but many of ideas and concept-arts I'm collecting and pre-preparing couple of years. 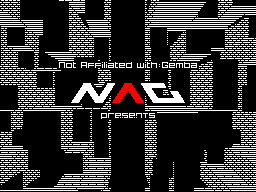 Last summer when I was fired from Gemba Boys (because they didn't share my vision of concept, design and precisely synced demo productions with smooth transitions between fx) I decided to give up all my demoscene activity. But thanks to all my friends from SinDiKat/sk and ellvis who support and encouraged me, I've started to work hard on this my present for 20th anniversary of FOReVER party. I was resigned to the fact that I will not be able to complete it until the party deadline but late January I kicked up work on my brand new demo kernel built on BS-DOS of MB-02+ disk interface. Why MB-02? I was sure in advance that I will need more memory that ZX-Spectrum 128K should give me to implement that intro effect with flyout above the city. Sure, I could made it to the Pentagon 512+ (and I'll probably going to do it after the final release!) but I want to support and resurrect that a little-bit forgotten disk interface which have an incredible features and capabilities and which I grew up with in 90s. After the kernel has been tuned (with the kind help of Busy, author of BS-DOS) I could start working on fx and syncing it to the awesome N1k-o soundtrack (which need to be optimized to fit the 16k page with my "VortexTracker swing tempo data optimizer" which I develop to GemBand musicdisk, haha). Fortunately, I managed to finish the first half of this one-man-show before the deadline, so you can see just video of that party version until the stop-time. Yeah, some transitions are not 100% finished but I wanted to share, though unfinished prod with the whole audience of FOReVER 20. Super good sync and transitions, just wish there was more! great demo, but should have been shown in a regular compos. I dont fully understand why it was in Wild ...because of disk interface? Yep, good stuff, inspiring! Cool design. I like it even better now, when I saw all the details (I may have missed them during the compo, as I was standing far from the bigscreen). jawdrapping transitions and a killer pace. wonder it's a wild demo. in any modern russian party in should kick asses in a plain zx demo compo! page created in 0.015352 seconds with 15 queries.